One of my fun places to stop in North Dakota is Jamestown. It is known as the “Buffalo City” and one can find all kinds of Buffalo things, including “the World’s Largest Buffalo” statue and the National Buffalo Museum. It was commissioned in 1959 by local businessman Harold Newman, and built by art students from Jamestown College, under the supervision of art instructor and designer, Elmer Peterson. It is visible from Interstate 94, overlooking the city from above the James River valley. The statue is 26 feet tall, 46 feet long and weighs 60 tons. It was constructed with stucco and cement around a steel beam frame shaped with wire mesh and is one of the giants across the US. See more about my visit to Jamestown HERE. Known as “The Little Switzerland” of the United States, Joseph, Oregon is a scenic town on the shores of the lovely Wallowa Lake. I visited this community in 2007 and was enthralled by the beauty. Like many towns, they have an art walk with many fine outdoor sculptures, including the intricate eagle sculpture “The Spirit of Joseph” by Steve Parks. Joseph was named after Chief Joseph of the Wallowa Band of the Nez Perce Tribe. Joseph is also about an hour away from the awe inspiring Hell’s Canyon. Despite the grandeur and wide expanses of the Grand Canyon in Arizona, Hell’s Canyon has been carved much deeper by the Snake River. The canyon is about 100 miles in length and there is one 40 mile section that is nearly 5500 feet deep. But the steepest point from river to rim is at Granite Creek. This is an amazing 7900 foot deep section of the canyon!! The widest expanse across the canyon is 10 miles. The Hell’s Canyon Scenic Byway is an awesome way to spend a day driving and taking in the wonderful views. See more about my NW Oregon and SW Washington roadtrip from 2007 HERE. Just across the Ohio River from Louisville, KY is the river town of Jeffersonville, Indiana. Two different cities and a shared river and bridge. In September 2013 , with camera in hand, I drove around Louisville and then across the river to Jeffersonville. The town has a series of floodwall murals which are delightful to walk along and see. Turns out that the 12 murals depicting the history of Jeffersonville were painted by Robert Dafford and his crew. This project began in 2007 and was completed in 2012. Ironically, I had seen his mural works in previous visits to Point Pleasant, WV, Paducah, KY and Portsmouth, OH. (see Paducah work here and the Point Pleasant work here). Dafford apparently has his photorealistic mural art in over 200 locations around the world. Jeffersonville is also home to The Industrial Terrorplex, a massive haunted house and “horror complex” created using state of the art Hollywood effects, offered up some surprises as I rounded the corner. A couple of huge gargoyles were waiting on the fencepost to pounce down on me. See more about this unique Ohio River town in my 2013 post HERE. One of the few places you cannot get to on a backroad by car is Juneau, Alaska. Only accessible via air or boat, we visited while on a cruise in June 2004 with other family members. Sitting along the Gastineau Channel, the town is picturesque and touristy. It is the gateway to Mendenhall Glacier as well. Mendenhall Glacier is about 13.6 miles long located in Mendenhall Valley, about 12 miles from downtown Juneau. We also took the Mount Roberts Tramway to the top of the mountain and enjoyed a spectacular view. The tramway’s cars rise 1,800 feet from the cruise ship dock in downtown Juneau through the rain forest to the Mountain House, offering expansive views of Juneau and Gastineau Channel. The Tramway is one of the most vertical tramways in the world. See the entire report of this trip HERE. 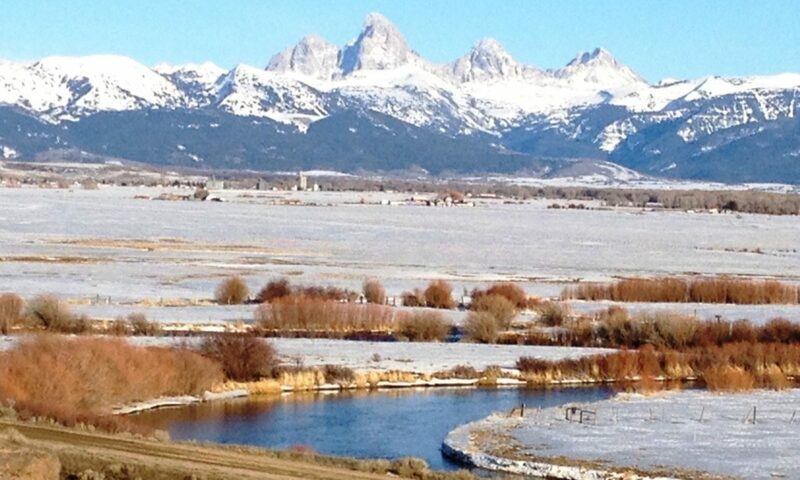 One of my FAVORITE places in the US is Jackson Hole, Wyoming. It is the gateway to the Grand Tetons National Park and is a beautiful town nestled in a picturesque valley. See my full post from a 2013 visit HERE. It is one my “Heaven on Earth” places. Another of the interesting towns in Wisconsin, Janesville is not too far from Madison and north of Beloit. The town has big cows and cheese factories as well as a great history. Definitely worth a visit. Jackson Center, Ohio is the home of the Airstream Factory. Everyone has seen these iconic trailers on the roads. This is where they come from. They give tours!! Check out a report about my visit there in May 2008 right HERE. On one end of Galveston Island in Texas is Jamaica Beach, with nice beaches, condos to stay in and wonderful views of the Gulf of Mexico. Brown pelicans are in the air everywhere. See my 2014 post with many pelican shots and lots of views of the beautiful gulf coast HERE. Finally, I would be remiss if I didn’t include another Jamestown. (And yes, I have also been to Jamestown, VA to see the old Jamestown history!!) Jamestown, New York is the birthplace of iconic TV star Lucille Ball. There is Lucy and Desi stuff all over town. We didn’t have time to visit the Lucy-Desi Center, but I did at least get shots of the facilities and the murals. See my full report about my New York trip to Jamestown and other places nearby by clicking HERE. After a long two days of driving from Lexington thru Tennessee, Mississippi and Louisiana, I got to spend three days with family relaxing on the beaches of Galveston Island and visiting many of the interesting sites on the island. And, for me, I got to spend some time watching the amazing brown pelicans as they flew in formation, glided over the Gulf of Mexico and took amazing dives for fish. It was a wonderously amazing visit. Galveston is not only a city in southern Texas but is also an island. The city actually sits on Galveston Island and Pelican Island. The town was named for Gálvez-town or Gálveztown in honor of Bernardo de Gálvez y Madrid, Count of Gálvez by Spanish explorer José de Evia during his charting of the Gulf Coast in 1785. Since that time many beautiful buildings were built, including some expansive hotels and old church buildings. The main reason for coming to Galveston was a Kravetz family reunion. It was great to spend time with my cousins, uncles, aunts and sister and dad. It was nice to see the family…but no pics of them here. Unfortunately, it was a bad year for sargassum seaweed buildup. The beaches had piles of smelly seaweed everywhere. In fact, there were tractors having to try to scoop up the stinky stuff. This was a result of cold fronts that kept the seaweed in the southern Gulf longer than usual, where it continued to thrive in warm waters. The seaweed then floated north, deluging many of the beaches along the gulf. Despite the seaweeds, the beaches were still enjoyable. I usually am going going going, but, since family was all together, I was able to just take it easy. In fact, I sat in a beach chair and just watched the pelicans and seagulls and those strange two-legged mammals (humans) frolic in the waves. Though family is always important, my fondest memories of Galveston will always center around the graceful brown pelicans. Their effortless floating over the city was fascinating. In fact, I loved how they flew in unison as many of the photos below show. Then, while sitting on the beach I saw something else that just blew me away. I witnessed these graceful pelicans take high-speed nose dives into the gulf. While diving, the pelicans appeared to rotate their bodies ever so slightly to the left. My research verified this and indicated that the rotation helps the birds avoid injury to the esophagus and trachea, which are located on the right side of their neck. They have also apparently learned that a steep dive angle, between 60 and 90 degrees, reduces aiming errors caused by water surface refraction. This is pretty amazing. I tried to capture a few shots of this unique practice. A pelican on impact after a dive (had to take dozens of shots to catch this) – and a jet skier made it more interesting! I also enjoyed watching the seagulls. I have always been used to seeing white ones, but the ones in Galveston are darker and have black heads. These are apparently called Laughing Gulls. Galveston island is about 27 miles long and about 3 miles wide at its widest point. During my visit I circumnavigated most of the island. My cousins rented a beach house in Jamaica Beach, which is on the southwestern end of Galveston Island and the only other town on the island. We went there a couple of times during the visit and it was a nice drive. Before getting into Jamaica Beach, I passed the Pirate’s Beach neighborhood, which sits between the highway and the Gulf of Mexico. Some really amazing beach houses here, many of them built after the devastation of Hurricane Ike in 2008. In the main town area there are a number of other rental properties that sit on some land that juts out between Jumbile Cove to the south and Carancahua Cove to the north. Many of the homes sit next to small waterways where boats can be docked and then taken out to sea. Many of the roads were named after pirates. The main entry is Buccaneer Blvd. One of the recurring themes of my trip down to Galveston (and home as well) was alligators. I visited the home of “Swamp People” in Louisiana the day before and on the way through Mississippi stopped in Alligator, MS. So, it was only logical that I would run into something alligator related while in Galveston…. I got a kick out of the product. “Smoked Alligator with Pork Jerky.” Made me wonder if the alligators were “pork fed” before being made into jerky…..
Back into Galveston….Seawall Blvd. is the “main drag” along the coast. This stretch of road runs between the resort shops, restaurants and fast food places and the main beach. Typical beach wear shops can be seen, as well as unique multi-person bicycles called surrey bikes. I had never seen these before, but it occurs to me that these are the perfect mode of transport along the beaches. There were rental places all along Seawall Blvd. Unfortunately, I didn’t get to try one of these out. I should have!! But I enjoyed the beach scenes anyway. Of course, there are all of the unique hotels, restaurants and shops to be seen. I tried a couple of the restaurants while there. Also drove by and captured shots of some of the hotels, condos, etc. What’s a beach resort without places with thatched roofs? While I was in Galveston, my wife was with her sisters and brother on the beach in San Diego. I had hoped we could adjust our schedules and take photos at the same time on the beach…but it didn’t work out. But, I did capture something that was pretty fun. They were staying at a condo time share in San Diego called “Capri by the Sea.” I ran into one in Galveston and called her. So, we were both at Capri by the Sea at the same time…in different places. There is a completely different part of the town of Galveston, called the Strand Historic District. While all of the family was on a boat ride, I drove around that area. There were large cruise ships, old shops, museums, seaside diners and more. Back on Seaside Blvd. is Pleasure Pier, Galveston’s answer to “Coney Island.” The Current Galveston Island Historic Pleasure Pier was built 1,130 feet out over the Gulf of Mexico waters and had its “soft” opening on May 25, 2012. The new pier compile is located where the original Pleasure Pier stood from 1943 until 1961, when it was destroyed by Hurricane Carla. The original Pleasure Pier featured rides, an arcade, an aquarium, concessions, a large ball room, named the Marine Ballroom, and fishing at the end of the pier. It was also the site of the USS Flagship Hotel, an over-the-water hotel built in 1965 that was demolished after Hurricane Ike in 2008. The Pier has a midway with games and amusements and then there are a number of rides, some of them that glide right over the gulf of Mexico. I didn’t visit….but we stayed close, so I did get a couple of photos. Galveston does not have many sculptures, but there is one on the seawall that is well-known. Commissioned by the Galveston Commission for the Arts and installed in 2000, Galveston sculptor David W. Moore’s bronze sculpture is a monument to the victims and survivors of the 1900 Storm, which killed in excess of 6,000 Galvestonians, making it the worst natural disaster ever to hit the United States. The only other major sculpture of any consequence in Galveston is the “Texas Heroes Monument” located at the intersection of Broadway and Rosenberg Avenue. It was commissioned by Henry Rosenberg to commemorate the brave people who fought during the Texas Revolution. The monument was built out of granite and bronze. The sculptor of the monument was Italian artist Louis Amateis and was unveiled on April 22, 1900. The monument is 74 feet high including the statue of Victory. The base of the monument is thirty-four feet in diameter. The bulk of the monument consists of four columns made from a single block of granite. These are fifty feet high. At the top of the columns are words which represent the qualities of the men who fought for Texas: Patriotism, Honor, Devotion, Courage. The statue of Victory is twenty-two feet high. She holds a sheathed sword entwined with roses and her right extended hand holds a crown of laurels. Overall, I had a great time with family and a great time visiting Galveston….even in the middle of the summer! !